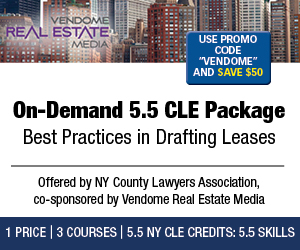 Thank you for your interest in Landlord vs Tenant eAlerts. Please note that you’ll be emailed our next monthly eAlert as soon as it’s published! In the meantime, you may view recent eAlerts HERE. 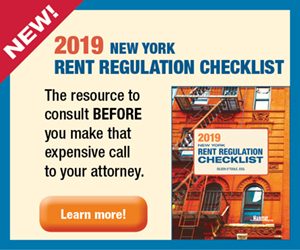 New York Apartment Law Insider, the go-to resource on how to best deal with New York agencies that owners and managers regularly come in contact with, including the Division of Housing and Community Renewal, the Department of Buildings, the Department of Finance, and the Department of Housing Preservation and Development. 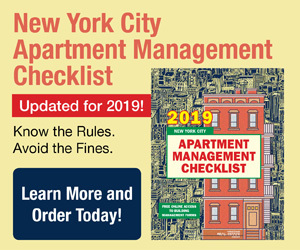 2013 New York City Apartment Management Checklist, the definitive source of information on the myriad of complex laws that govern the management of New York City apartment buildings.